Gulfstream demonstrator aircraft have been regular visitors to New Zealand skies in the past year. The latest to visit was the company’s “baby”—the G150. 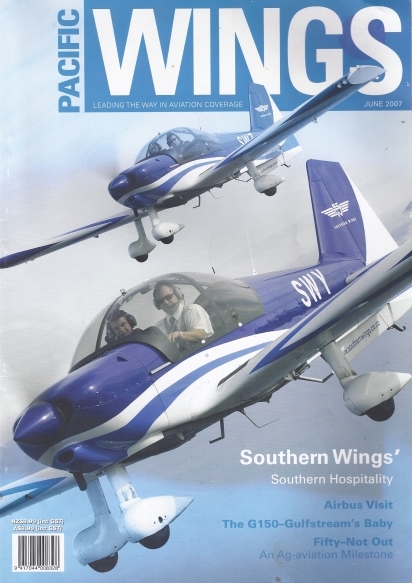 Pacific Wings’ Airline and Business Aviation correspondent, Graeme Mollison, checked out the evolutionary aircraft. The insidious decline of aero club flying and general aviation around New Zealand appears to have been halted in the country’s southernmost city. Rob Neil talks to the people behind Invercargill’s Southern Wings to find out how. Each year, at its headquarters in France, Airbus hosts aviation publishers and editors from around the world for a Technical Press Briefing. Rob Neil joined over a hundred other aviation publishing industry professionals in Toulouse. Ray Deerness visits an industry icon and reports on the ag-aviation milestone reached by John Harding in late 2006. Always seeking something new and interesting to photograph, Stuart Haigh hired an aircraft to overfly a historic Hungarian airbase. His camera captured squadrons of neglected Russian aircraft quietly corroding in picturesque surroundings. In a 58-year aviation career, engineer Des Budd, who retired in March 2007, has seen more changes in New Zealand’s aviation scene than most. Graeme Mollison recognises Des’s service.